Save several people from Dagoth Ur's spell. This quest is different from normal quests in some aspects. There are multiple separate events that start and update the quest and there are different ways to solve it. While advancing through the Main Quest, various events will occur that show the growing influence of the Sixth House. Several people will start talking oddly, announcing the rise of Dagoth Ur, and you will receive a couple of disturbing dreams and cultists will eventually attack you in your sleep. The events that trigger this quest will start during Caius Cosades' first quest. The quest will remain active during the entire Main Quest, and be marked as finished after destroying Dagoth Ur. "You had a disturbing dream. You can only recall one point. A tall figure with a golden mask led you among the dead as through a wedding celebration. You heard many voices, but no lips moved. You strained to breathe, but your chest didn't move. The tall figure spoke with each figure as he passed among them, laughing and joking, as if they were alive, but they made no reply. You tried to cry out, but without breath, your tongue fluttered in vain." 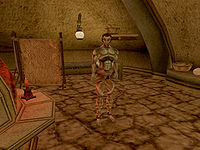 While advancing through the informant quests given by Caius Cosades and sleeping in Ald'ruhn, Balmora or Vivec you will receive disturbing dreams about a tall figure with a golden mask (Dagoth Ur). You will receive your first dream after you have returned the Dwemer Puzzle Box during the Antabolis Informant quest, your second and third after you talk with Addhiranirr and Mehra Milo, respectively, during the Vivec Informants quest. You will receive the last dream after the Zainsubani Informant quest. After having the first dream, you can talk about it with a few people by mentioning the disturbing dreams topic. Caius Cosades will be worried, but can only warn you not to listen to them. Mehra Milo will advise you to speak to an Ashlander about this. If you talk to an Ashlander they will just direct you to a Wise Woman, though Hassour Zainsubani can tell you a bit more about them. Of all the Wise Women, Nibani Maesa of the Urshilaku Camp, will be best able to explain the dreams to you. This will not stop the dreams from occurring though. After you have returned the Dwemer Puzzle Box during the Antabolis Informant quest, you will notice various Dunmer approaching you at night. They will speak oddly about the rise of Dagoth Ur and call themselves "Sleepers". If you are a Dunmer yourself they will invite you to come to the Red Mountain and join the Sixth House. If you are not, they will warn you to leave Morrowind while you still can. Each time they speak to you, their disposition towards you will drop. Be careful: If they hate you enough, they might attack you. After you have completed the Sixth House Base quest, and sleep in Ald'ruhn, Balmora or Vivec you will be attacked by an ash zombie. You can report this to Caius Cosades and he will advise you to sleep outside of town. He will also advise you to search for a nearby base of Sixth House cultists before they attack you again. There is one definitive way to solve the quest, and that is to destroy Dagoth Ur. This will stop the attacks and will lift the spell that was influencing the Sleepers. It is also possible to stop these events by killing the four cultists responsible: Dagoth Fovon, Dagoth Hlevul, Hanarai Assutlanipal, and Dagoth Draven. All four cultists can be killed at any time, despite any quests associated with them. The Tribunal Temple quest Dark Cult in Hassour sends you to Hassour to eliminate the Sixth House cult there, and ultimately Dagoth Fovon. Killing Dagoth Fovon will save Dralas Gilu, Drarayne Girith, Llandras Belaal and Rararyn Radarys from Dagoth Ur's influence, and stop the attacks when sleeping in Balmora. The House Hlaalu quest Control the Ordinators involves retrieving an artifact in Assemanu. Dagoth Hlevul can be found in Assemanu, Shrine. Killing Dagoth Hlevul will save Alvura Othrenim, Daynasa Telandas, Eralane Hledas, Neldris Llervu, Nelmil Hler, Relur Faryon and Vivyne Andrano from Dagoth Ur's influence, and stop the attacks when sleeping in Vivec. The House Redoran quest Ash Statue deals with tracking down Hanarai Assutlanipal, the cultist in Ald'ruhn. She can be found in her own house. The most likely way to stumble across her is through rumors about Morvayn Manor having been trashed by monsters, and decide to do a little investigating on your own account - which will give you the ash statue, and may open up the subject of ash statues with others such as Lloros Sarano, Varvur Sarethi and Galtis Guvron, who becomes hostile at the subject and drops a note that mentions her first name. Killing Hanarai Assutlanipal will save Dravasa Andrethi from Dagoth Ur's influence, and stop the attacks when sleeping in Ald'ruhn. Dagoth Draven is not involved in any quests. He can be found in Subdun, Shrine. Subdun is located on a rocky island off the northwest coast of Morrowind (the nearest landmarks are Koal Cave and Berandas). Killing Dagoth Draven will save Assi Serimilk, Endris Dilmyn and Vireveri Darethran from Dagoth Ur's influence. No one will give you a reward when completing this quest, but after you have saved a Sleeper from Dagoth Ur's influence, by either finishing the Main Quest or killing the cultist responsible, you can talk to him or her. They will thank you for saving them and state that they will tell everyone they know how you saved them, causing you to gain 1 Reputation point. This can be done with every Sleeper for a total of 15 Reputation points. The quest will still remain active after eliminating the four cultists. Completing The Citadels of the Sixth House quest will remove it from the journal. If you are attacked by a cultist in a certain town, you will not be attacked there again until you have slept at least once outside that town. If you kill an essential NPC (with the exception of Vivec), sleepers will refuse to speak to you and cannot be cured, even after completing the Main Quest. Due to an error in Neldris Llervu's dialogue it is possible to repeatedly receive Reputation points each time you mention Sixth House to him, after you have saved him from Dagoth Ur's influence. This only works if you saved Neldris by killing Dagoth Hlevul (instead of finishing the Main Quest). Once you complete the Main Quest, the glitch no longer works. This bug only applies to Neldris and no other sleepers. Once a sleeper has become aggressive, they will remain hostile toward you even after you cure them. You'll need to calm them temporarily in order to speak to them. 1 Finishes quest I had a disturbing dream. I can only recall one part. A tall figure with a golden mask led me among the dead as through a wedding celebration. I heard many voices, but no lips moved. I strained to breathe, but my chest didn't move. The tall figure spoke with each figure as he passed among them, laughing and joking, as if they were alive, but they made no reply. I tried to cry out, but without breath, my tongue fluttered in vain. 5 Finishes quest In my dream, a tall figure with a golden mask greeted me, saying, "There are many rooms in the house of the Master. Be easy, for from the hands of your enemies I have delivered you." It seemed I had died and could see myself laid upon a table lit by candles. But with my own hands I touched the figure, and the figure drew breath, opened eyes, and rose from the table. Then the room was gone, and the world filled with light, and I awoke. 10 Finishes quest I dreamed that a tall figure with a golden mask spoke to me, but I understood not a word. He smiled, and seemed pleasant, but when he reached to touch me, it terrified me, and I tried to escape, but I couldn't move. I tried to cry out, but I couldn't make a sound. The figure kept smiling and talking, but I felt sure he was trying to cast some sort of spell on me. When I woke, I couldn't recall how the dream ended. 15 Finishes quest In my dreams, a tall figure in a golden mask spoke to me. "Lord Nerevar Indoril, Hai Resdaynia! Long forgotten, forged anew! Three belied you, three betrayed you! One you betrayed was three times true! Lord Voryn Dagoth, Dagoth Ur, steadfast liegeman, faithful friend, bids you come and climb Red Mountain! Beneath Red Mountain, once again, break your bonds, shed cursed skin, and purge the n'wah from Morrowind!" 1 Gindrala Hleran says there's a strange man in her house, and he won't leave. She asked me to get him out of there, because he is scaring her. 50 Finishes quest I told Gindrala Hleran that I had to kill the strange man who had invaded her house. She was grateful, and promised to tell everyone how kind and brave I'd been. 1 I spoke with one who called himself a "Sleeper." He called me by name, and said, "You cannot deny your Lord, Dagoth Ur. The Sixth House is risen, and Dagoth is its glory." He made no sense at all. I think he must have been mad. 3 Sixth House cultists attacked me as I slept in my bed. 5 I told the Spymaster how Sixth House cultists attacked me as I slept in bed. The Spymaster said it may not be safe to sleep in town. Perhaps I should search for a nearby base, and attack them before they attack me. 7 I was attacked by someone called a "Sleeper," for no apparent reason. 1 Finishes quest I spoke with Alvura Othrenim who had been driven mad by dreams of Dagoth Ur and the Sixth House. This former 'Sleeper' thanked me, and promised to tell others how I had saved her life. 1 Finishes quest I spoke with Assi Serimilk who had been driven mad by dreams of Dagoth Ur and the Sixth House. This former 'Sleeper' thanked me, and promised to tell others how I had saved her life. 1 Finishes quest I spoke with Daynasa Telandas who had been driven mad by dreams of Dagoth Ur and the Sixth House. This former 'Sleeper' thanked me, and promised to tell others how I had saved her life. 1 Finishes quest I spoke with Dralas Gilu who had been driven mad by dreams of Dagoth Ur and the Sixth House. This former 'Sleeper' thanked me, and promised to tell others how I had saved his life. 1 Finishes quest I spoke with Drarayne Girith who had been driven mad by dreams of Dagoth Ur and the Sixth House. This former 'Sleeper' thanked me, and promised to tell others how I had saved her life. 1 Finishes quest I spoke with Dravasa Andrethi who had been driven mad by dreams of Dagoth Ur and the Sixth House. This former 'Sleeper' thanked me, and promised to tell others how I had saved his life. 1 Finishes quest I spoke with Endris Dilmyn who had been driven mad by dreams of Dagoth Ur and the Sixth House. This former 'Sleeper' thanked me, and promised to tell others how I had saved his life. 1 Finishes quest I spoke with Eralane Hledas who had been driven mad by dreams of Dagoth Ur and the Sixth House. This former 'Sleeper' thanked me, and promised to tell others how I had saved her life. 1 Finishes quest I spoke with Llandras Belaal who had been driven mad by dreams of Dagoth Ur and the Sixth House. This former 'Sleeper' thanked me, and promised to tell others how I had saved his life. 1 Finishes quest I spoke with Neldris Llervu who had been driven mad by dreams of Dagoth Ur and the Sixth House. This former 'Sleeper' thanked me, and promised to tell others how I had saved his life. 1 Finishes quest I spoke with Nelmil Hler who had been driven mad by dreams of Dagoth Ur and the Sixth House. This former 'Sleeper' thanked me, and promised to tell others how I had saved his life. 1 Finishes quest I spoke with Rararyn Radarys who had been driven mad by dreams of Dagoth Ur and the Sixth House. This former 'Sleeper' thanked me, and promised to tell others how I had saved his life. 1 Finishes quest I spoke with Relur Faryon who had been driven mad by dreams of Dagoth Ur and the Sixth House. This former 'Sleeper' thanked me, and promised to tell others how I had saved his life. 1 Finishes quest I spoke with Vireveri Darethran who had been driven mad by dreams of Dagoth Ur and the Sixth House. This former 'Sleeper' thanked me, and promised to tell others how I had saved her life. 1 Finishes quest I spoke with Vivyne Andrano who had been driven mad by dreams of Dagoth Ur and the Sixth House. This former 'Sleeper' thanked me, and promised to tell others how I had saved her life.